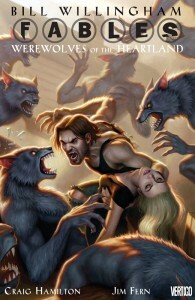 Furry fans can usually expect some interesting — sometimes silly, sometimes scarey, sometimes gross — anthropomorphic animal stuff to turn up in the pages of Fables, the award-winning comic book series created by Jim Willingham. The latest full-color opus from the DC Comics Vertigo imprint is Fables: Werewolves of the Heartland, illustrated by Jim Fern, Craig Hamilton, Ray Snyder, and Mark Farmer (whew!). Here’s the publisher’s description from Amazon: “Bigby Wolf takes center stage in the most brutal, action-packed FABLES story to date. Sent out into modern day America at large, Bigby’s on a quest for possible locations for a new Fabletown. In his wanderings, Bigby stumbles across a small town named Luperville, somewhere in American’s vast heartland, that, amazingly enough, seems to be populated by werewolves. These werewolves are descendants of a World War II German project to create an army of werewolf super soldiers, some of whom who were infected with Bigby’s tainted blood. And even more unfortunate the fact that they’ve captured, caged and tortured the most popular and important canine in history: Bigby Wolf.” According to Amazon this 144-page hardcover graphic novel will be released in early November.